Of all the game genres that I expected to catch on with mobile devices, the strategy niche was not among the top of the list. 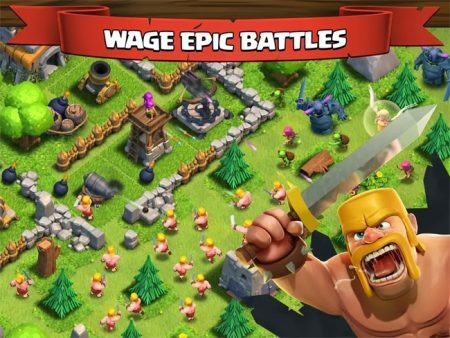 Lo and behold, Clash of Clans has become one of the most popular mobile games available on Android and iOS, and so Appamatix is here with a smattering of login tips and tricks to enhance your gameplay. If you’ve wanted to step up your gameplay with simple methods–or bring your experience to the larger screen of your laptop or desktop–read on for the juicy details! One of my earliest PC gaming memories was with Starcraft, a sci-fi RTS game (real-time strategy) that pitted humans and two alien races in a galactic-scale conflict against each other. It challenged me in ways that I hadn’t found in games before, making me juggle resource management, unit development and strength, and enemy strategies like I’d never had to before. I might have learned more about resourcefulness and critical, creative thinking from Starcraft than I did from school that year. Perhaps it should be no wonder, then, that Clash of Clans has become such a mobile gaming phenomenon. That it fosters practically as much communication between players as an actual mobile messaging service is probably a testament and a reason for its success, as well as the ease with which new players can give it a try. It’s free to download and free to play, after all. We’ve covered Clash of Clans extensively before, and if you look at the original dates that some of our first articles about the game were published, you can see just how long it’s been popular. However, in all of the time that Clash of Clans has been around, new users are coming on board and experienced players are looking for ways to shake up their gameplay for the better…even if that just means changing the venue from which they’re playing. We’ll tackle this guide with the aim of helping users in both of these camps. If you’re a newbie to Clash of Clans, simply keep on reading! If you’re an old Clash vet that just wants to learn a few new tricks (like emulation on your PC), then feel free to skip past the familiar stuff! From login to victory, we have tips to help you better manage your resources and win more often. Here’s the quick ‘n dirty, for those of you just starting out: Clash of Clans is a real-time strategy game with focused multiplayer elements that encourage you to constantly interact with other players. If you’re looking for a strategy game that allows you to play with other people while also maintaining a play style that best suits you, you’re in the right place. You’ll be building your own “clan” of barbarians, mages, and other comically-drawn medieval warriors that will, in turn, conquer and ally with other players’ clans. You’ll build, you’ll train, you’ll gather resources that need to be well-managed and well-spent because they can also be stolen. Clash of Clans if free to download and free to play, but the amount of time that you’re able to spend playing will always be a bit limited unless you’re willing to make a few in-app purchases to free up that time. Don’t sweat it, though; if you don’t want to pay, then you can still get plenty of Clash game time in. As for myself, I view it as an extra challenge to play these games without spending any money on them. It forces me to be resourceful and always encourages me to be a better Clash of Clans player. The first part is easy! Head to your device’s respective app store and search for Clash of Clans. There’s only one version of the game available, and since it’s often an editor’s choice (remember, it’s hugely popular!) it should be easy to find. Tap it, download it and let it install on your smartphone or tablet. Easy, right? After this, boot up the game for the first time. You’ll be walked through the profile creation process so that you have a name to play under for the duration of your Clash of Clans experience. After you’re up and running, you can jump right in by starting the game’s single player campaign. Before you do so, however, read through these brief points that will help you to get your strategies on the right track before they even start. When you first learn how to upgrade your units and buildings, it can be tempting to go whole hog and dump all of your resources into the things that you’re enjoying most at the moment. There are few things that will more swiftly set you up for defeat. The only surefire way strengthen a strategy that uses particular units and buildings is to learn how to play better with them. Upgrades are definitely worth your while, but investing too many of your resources into a particular upgrade path will leave you weak, elsewhere! Managing those resources is just as important as keeping track of your upgrade path. There are a few different reasons for this, some of which escape the attention of Clash of Clans players until it’s too late! In an RTS game, you always want to be busy. If you’re not busy, you’re usually missing something. Likewise, if you have unused resources floating around, you’re probably not spending them as you should. Similarly, any resources that are floating around can be stolen in a raid! If you typically find yourself hoarding all of those precious commodities, spend them in useful ways. Even though a good strategy is worth any number of upgrades, unspent resources usually indicate that your clan isn’t as strong as it could be. Spend, but spend wisely! Clash of Clans can be a fun game to play by yourself, but it’s intended to be played with other people. Therefore, it’s in your best interests to find your way into a clan of other players as soon as you’ve found your footing within the game. Always double-check to make sure that a clan is actually active before joining, but otherwise, immerse yourself in the experience! Though everyone should certainly find and develop their own strategy, I always recommend new strategy gamers to learn how to build a proper defense, first. The reason? It can outwardly seem like the “least fun” approach to Clash of Clans, namely because a good defense doesn’t involve building a horde of attacking units to ransack and raid your enemies. However, the benefits of being able to craft a good defense can save your hide from early in the single-player campaign until late in your multiplayer experience. Focus on those defense towers, and learn them well! When you’re looking for an “order” in which to upgrade your buildings and units, it never hurts to let your defenses take priority. Remember: your enemy can steal your resources if they sack your town hall! Clash of Clans on Your Desktop or Laptop? All right, gamers; here’s the best login tip that I’ll ever be able to give you. If you’re interested in bringing your CoC experience onto the bigger screen, then listen up. If you’re a regular Appamatix reader, you’ve probably figured out that we’re big fans of Android emulation. In lieu of developers creating an entirely separate series of apps that are compatible with Windows PCs and Macs, it’s the only way that we can bridge the smartphone experience with regular computing. Considering that it can be hugely liberating to play Clash of Clans with a bit more screen real-estate, I highly recommend giving this a shot if you enjoy the game. You have many different choices in emulator available, but at Appamatix, a few of our favorites are Bluestacks, Andyroid, and Droid4X. Check out the visual aesthetic of each, and pick the one that appeals to you! All of them can tackle Clash of Clans without any trouble whatsoever. Once you have your emulator installed (it only takes a few clicks!) boot it up. You’ll see that the interface greatly resembles that which you’d find on an actual Android device, which should make it very easy to find your way to the Google Play store. Do just that, and then search for Clash of Clans. Download it, install it in your emulator, and you’ll soon find yourself playing the same classic game in a much more comfortable way! No more squinting or “mis-taps” on your smartphone screen. Hopefully, the above tips and tricks will not only help you log in and start playing Clash of Clans but also make you a better Clash of Clans player! If you have your own tips and tricks for beginnings to the game, let us know in the comments below!